Whether you have two stroller aged kids or an infant and a toddler, picking the right double stroller can be a complicated buying process. How long will the stroller work for both kids? Is it adaptable for the older child to stand and ride when they outgrow their stroller seat? Will this double stroller work with the existing infant car seat? The number of considerations goes on and on, and it is hard to know what is most important when deciding on the right double stroller for your family. Fortunately, after much research, trial and error, and examining parent feedback, the number of considerations that affect your day to day stroller usage gets considerably smaller. Here are the factors and variables that are most important to think about when choosing a double stroller to accommodate your family’s lifestyle and needs and ensure that you get the best value for your investment. Go for the lightest model you can that has all the features you want. Individual strollers are pretty heavy all by themselves, but feature loaded double strollers can weigh in at up to a whopping fifty pounds! If you tend to take the kids out by yourself frequently, a heavy double stroller is not going to be the best choice since you will have to load and unload it from your vehicle, and if it is too heavy to be easily manageable, your two options are to pick a different stroller or start a strength training regimen. A good general rule to use when trying to lift a double stroller by yourself is whether or not you can pick it up in a folded position with one hand. If you can’t do it easily unassisted, that stroller is not going to be a good fit for you. 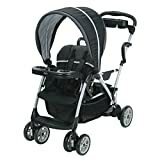 When you cannot find a double stroller light enough for you to manage alone, ask for double stroller models with aluminum frames or with frames and components that are made from other lightweight metals and plastics. Getting a double stroller you can easily lift and handle yourself can make a tremendous difference in how much value you get out of owning it. Most double strollers list the individual seat capacity and the total weight capacity of the stroller right on the box or listed on the feature card. If you can’t find it anywhere, ask somebody or do internet research. You want to make sure that your kids are not close to outgrowing the double stroller you are looking to buy in the near future, as that completely defeats the purpose. You also want to factor in the average weight of the gear you will be loading into the strollers cargo spaces if it has any, as this obviously will add to the total weight and you don’t want to overload your stroller. If you can’t find a stroller with enough room to grow, your find one that offers way more carrying capacity than you need, err on the side of having too much total weight capacity as opposed to too little. You will always have more things to carry or push in the stroller, so having the extra cargo and weight capacity is always going to be a value added feature. There are a couple of primary folding methods that most double strollers employ: the fold up and the fold down. Fold up strollers generally have a one handed operation where you click a button or switch on the pushbar that unlocks the folding mechanism. All you have to do is pull the push bar toward you, and the stroller folds up into a vertical position. Fold down mechanisms differ in that they collapse the stroller down onto its wheels so you can pick it up, stow it in its carrying case if it has one, and then load it into the car like a suitcase. It is entirely a matter of personal preference, however most people prefer the vertical folding style stroller as it is easier to lift and load than a stroller that is laid flat against the ground. Also, you need to consider what the folded dimensions of your potential stroller are in relation to your doorways, staircases, and your vehicle that you will use most often to transport the folded stroller. After all, if you drive a subcompact car and have a double stroller, it is likely that your car space will be at such a premium that your double stroller will occupy too much space and be a poor fit for your needs. Many double strollers come with a carry case to mitigate the transport and storage issue, and to make a neater package to transport, so they are also the recommended choice in most if not all instances. Ask yourself how you plan to use the double stroller. Is it for an occasional play date? WIll this be your daily driver for transporting your kids to and from appointments, errands, and classes? Do you plan to travel via air or road trip at all while your kids are still stroller age? All of these are very important questions to ask when choosing your double stroller, mostly because you may end up selecting a bunch of extras on a stroller you use once a week or less depending on you and your partner’s schedules. That’s why the next consideration is important to make when you are thinking over the needs of your lifestyle for your double stroller. If you can dream up an additional feature for a stroller, it probably exists on some model somewhere. Integrated Bluetooth audio systems, pneumatic all-terrain tires, Emergency brakes, weatherproof full enclosure canopies, fold-flat bassinet style seating for infants, and stand and ride platforms for active toddlers are just a few of the more exotic options for double strollers. Of course. that doesn’t even begin to cover basics like snack trays, cup-holders, and cargo carriers, so you will need to see what’s available and then use the final consideration in this guide to make a decision about what is most important. You can spend hefty sums of cash on a good double stroller with all the trimmings, bells, and whistles your heart desires, but you want to be practical about what you buy because your children are most likely only going to be sharing a stroller for a few years at best. Setting a budget of how much you can or should spend on a double stroller is a smart way to ensure that you not only do not overspend, but also that you get the best solution for your needs without loading it up with features and accessories that are barely used. As you can see, the number of considerations when choosing a good double stroller are significantly easier when you narrow them down into which factors and variables matter most on a daily basis. Take your time with the buying process as much as possible, and shop around for the best value until you find what you are looking for. Think about how you will use the stroller and how often, and decide in advance whether or not you want to make this a significant long term investment or a more minor short term investment before you even start looking online or visiting stores. Ask opinions of other parents who have had double strollers, read online reviews, and compare feedback from as many sources as possible before settling on a particular double stroller. If possible, take your final double stroller candidate for a test drive with your kids before making a purchase. Ultimately, the stroller needs to be safe, comfortable, convenient, and manageable for you and your family on a daily basis, and if you are looking at a stroller that doesn’t meet those basic requirements, then you need to look at other strollers. Best of luck on your buyer’s journey, and may your new double stroller give you years of happy and reliable service.